For many musicians, performing with an orchestra is a bucket list item, and for Irishman Niall Horan he achieved this milestone last year when he recorded nine songs with the RTE Orchestra (Ireland’s national symphony orchestra) on a rare trip home to the Emerald Isle. While Horan became one of the music industries rarest stories by making it big with the boy band One Direction, performing with an orchestra was a move that no one expected from the ex-boy band member, despite that he was the only musician in the band. Now that we’ve gotten a taste of Horan’s solo abilities on his debut Flicker, released last year, it’s not surprising that performing with an orchestra works out in his favor. Titling his first live release Flicker Featuring The RTE Concert Orchestra, you never know how an artist will sound once they undertake something like this, though in Horan’s case the attempt is a refreshing one, breathing new life into songs that sound great even without any enhancements or new parts. Opening with “The Tide,” the track sounds fuller while highlighting Horan’s great vocals and sense of what instinctively sounds good. While not every song on the record is featured on this live album, it sounds like Horan chose carefully which tracks he wanted to include on the LP. Regardless of whether or not you’ve seen the live broadcast of the performance on the BBC which premiered last year, the orchestra comes through so well on the speakers that it’s as if they are bringing you into the room to watch the performance personally. Next is “This Town,” Horan’s debut single that instantly became a hit upon release for its folk sensibilities and calm demeanor. Adding to its already minimalist feel, the strings hit on the emotion of revisiting a lost love from afar as the narrator reminiscences about what was. Complete with Horan’s known raspy vocals at different points, this version is one of the highlights of the record. Nearing the end of the record, Horan performs “Fire Away,” a perfect song to include on this release. As a violin and various other strings take the listener away, Horan does an excellent job creating an immersive experience that you won’t want to leave. Enveloping the listener from start to finish, Flicker has gotten a facelift with new sounds and perspectives. Ending with the album’s title track, it is one of Horan’s most popular songs on Spotify and to hear at live shows. 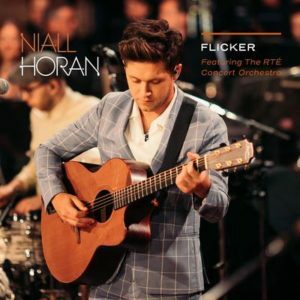 Opening with an acoustic guitar and Horan’s reflective and relatable lyrics, “Flicker” takes you to a place that only good music can, serving as a reminder for why so many turn to music as a therapeutic art form. Though Flicker Featuring The RTE Orchestra feels a bit short at only 33 minutes, it’s the presentation that counts, with Horan nailing every aspect of his performance and its production. Listen to “Fire Away” below.